Here is the list of step-by-step drawing tutorials that I wrote for The Virtual Instructor – the great place to grow the skills and become inspired! the nuts and bolts of drawing with ink liners. A creative approach to transferring a photo into an ink drawing. 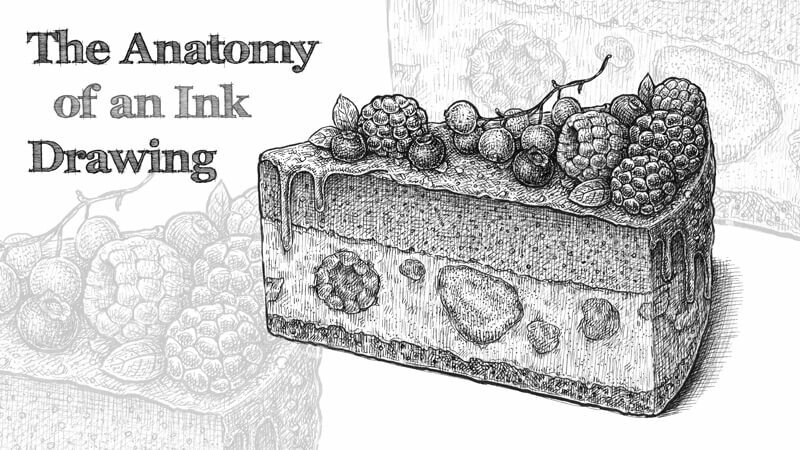 And, of course, a detailed guide to working with ink liners and depicting complex textures! Stippling is a great way to enter the world of ink. This technique is meditative and easy to understand; some objects seem to be made for it. What is more, dots can be different not only in size bit in color, too! This lesson is on using with water-soluble tinted graphite pencils combined with toned green paper. What a fascinating union! It seems that everybody wants to draw fun things. But is it really possible to skip the basics? I believe that practicing line and hatching exercises is beneficial for artists of any skill level. The lesson includes downloadable and printable worksheet! This master-class is a three-in-one guide to drawing a bluegill with ink on paper, scanning and editing it in Adobe Photoshop, and creating a digital painting layer to add the color. Ink has a reputation of an unforgiving medium; a blob of water, an accidental error or smear – and your beautiful artwork is ruined. But is it true? In this article, I’m talking about the meaning of mistakes and their important role. And, of course, we’ll observe the whole range of ways and tools to fix an unfortunate mistake. A quick tutorial on working with natural objects, using the ink liners. This project is a pure creative experiment; I’m drawing a pomegranate with colored pencils on red paper (quite an unusual color to use as a base). Chances are that you have an experience of gathering various leaves, flowers, cones, twigs, and other natural curiosities – at least, in the past. In this tutorial, I’ll show you a way to use your collections for creating an ink herbarium. 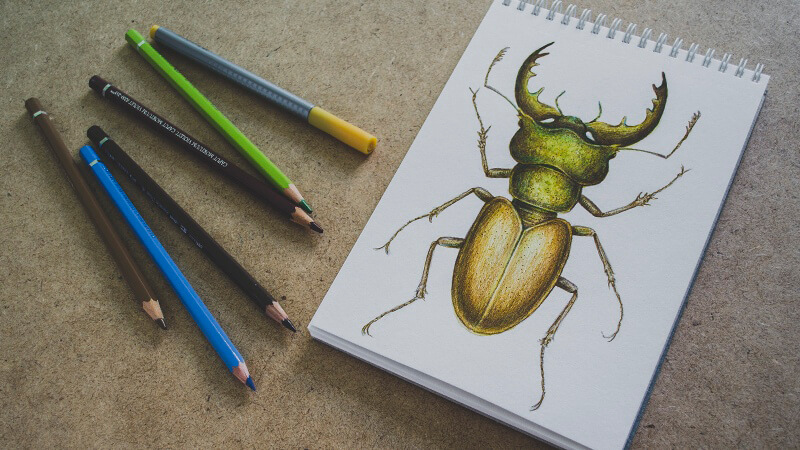 Also, there is an interesting approach that allows transforming your studies of nature into new artworks. Enlargening of the visual library is guaranteed! In this tutorial, we’ll create a beautiful ink illustration; it can be used to decorate a Christmas card for a person you love. Let’s make something festive together! Step-by-step drawing tutorials are everywhere; the majority of artists, especially the beginners, use them. Do you want to know how to draw x,y or z – chances are, somewhere on the web exists a piece of content right on point. But somehow it happens that artistic skill doesn’t grow – or grows very slowly. A person who relies on drawing tutorials too much often can’t understand how to draw anything without a detailed step-by-step instruction, and this causes frustration. 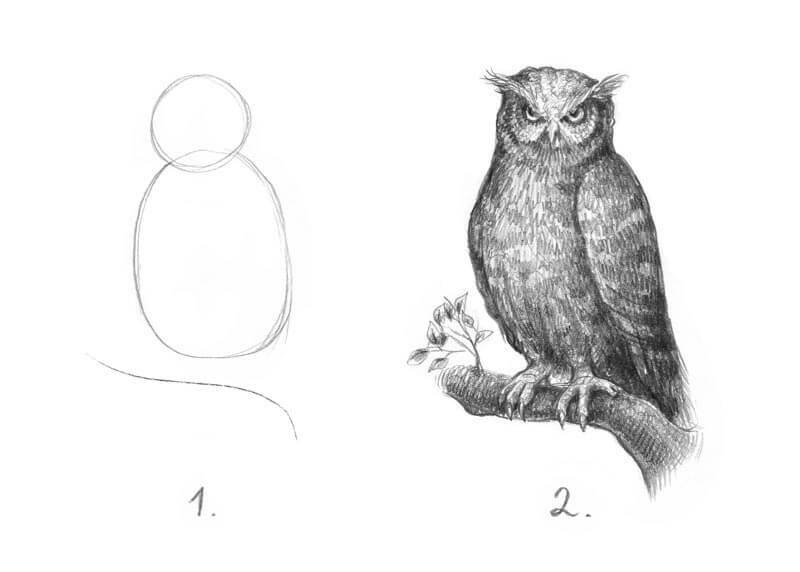 To learn more about the pitfalls of drawing tutorials and ways to avoid them, please check out the article. 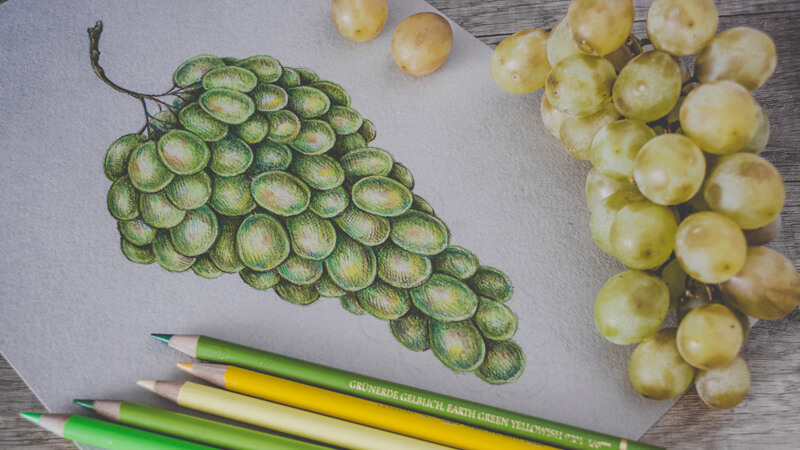 This quick and fun project is an example of how we can combine colored pencils and toned – in this case, grey – paper. Are you struggling to understand the general process of drawing with ink? Just being familiar with techniques is not enough; what is much more important is your clear vision of how to layer ink marks and the practical skill to combine those techniques. What if we had a basic algorithm for building our artworks? 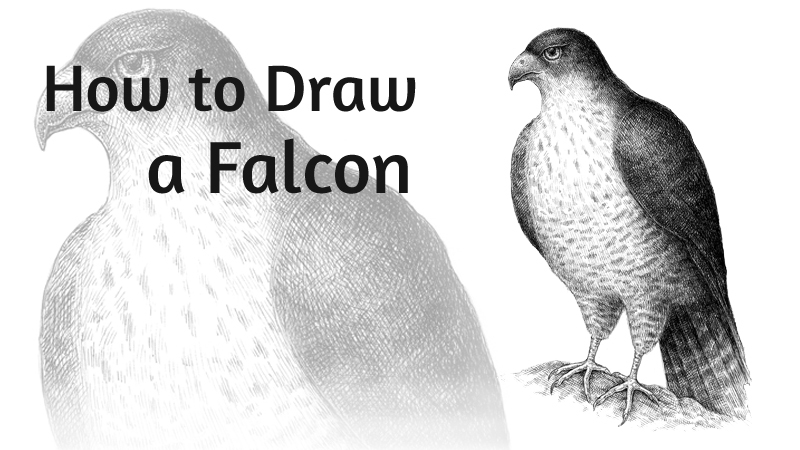 This tutorial is dedicated to falcons – majestic predatory birds that are known for their strength, maneuverability, and speed – in addition to incredible intelligence. We’ll learn the general principles of drawing contrasting subjects and working with the texture of bird feathers as a visual system. How to deal with a light surface that is in shadow? This post is just about that. Do you like combining different artistic media? Watercolor, pencils, and ink form a truly powerful union. This project is all about finding new tips to use in your art, playing with color, being curious and creative. Nature will be our inspiration!